This post has been sponsored by HP Hood but all opinions stated are my own. 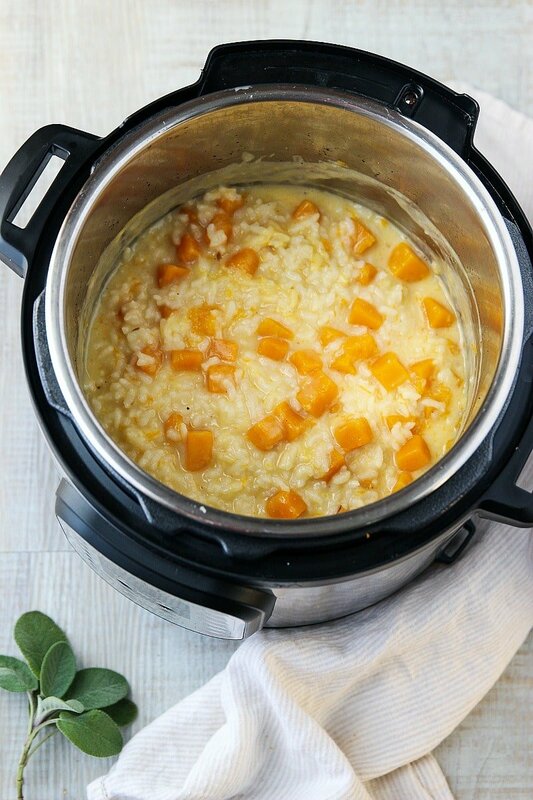 Instant Pot Butternut Squash Risotto flavored with buttery shallots, creamy eggnog, fresh sage and lots of parmesan cheese! 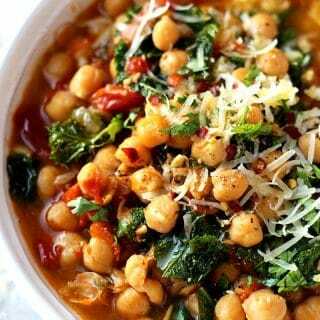 Meet the BEST risotto recipe! 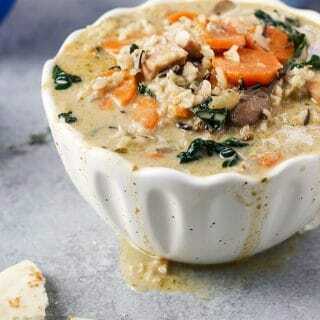 The last risotto recipe you will ever try! 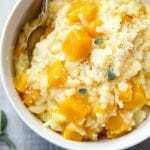 This Instant Pot Butternut Squash Risotto has a very important key ingredient that perhaps you never tried (in a risotto before). It’s about to become a must-have ingredient for your risotto and many other cream based recipes. EGGNOG! 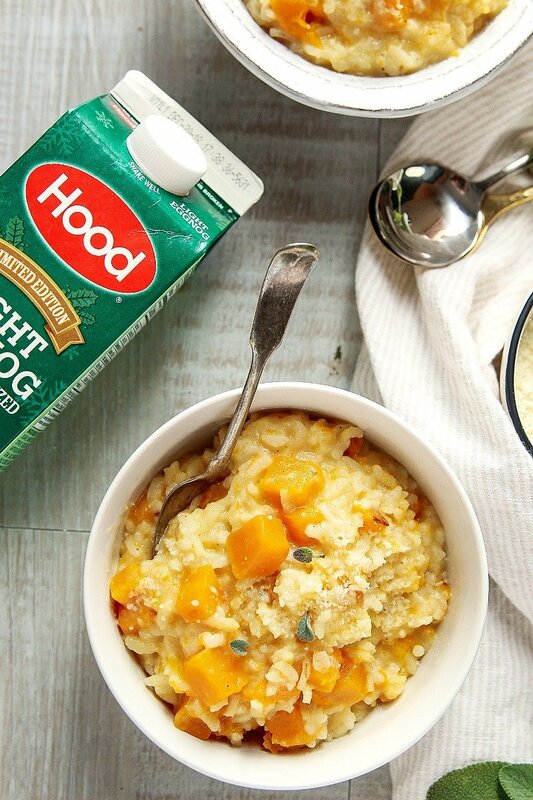 Mega creamy and rich, Hood® Light Eggnog is made with 55% less fat yet still creamy enough to take your risotto to the next level. 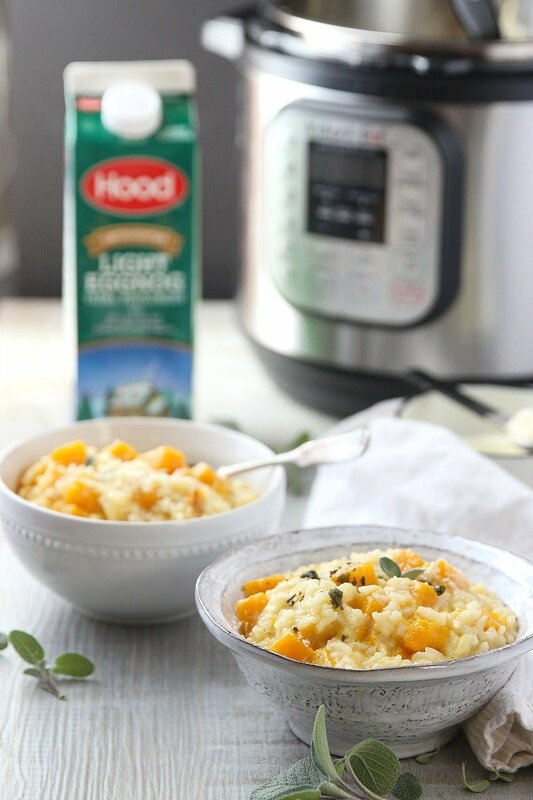 Hood Light Eggnog is the perfect complement to this recipe because as you know, a good risotto equals a creamy and rich risotto, and that’s exactly what Hood Eggnog adds to this dish. But let’s dive in deeper to understand what makes a good risotto, great. What makes a good Risotto, GREAT? The key to a good risotto lays on the creaminess factor. A great risotto must be rich and creamy. On the other hand, a risotto that is not creamy, is simply rice. In order to achieve the perfect consistency, creaminess and rich flavor, there are a few important steps to take, and understanding these steps is key to a successful risotto. Short grain rice has a greater ability to absorb liquid and release starch which is responsible for the creamy texture in risotto. This said, you never pre-rinse the rice because by doing so you would be removing much of the starch. Arborio rice is traditionally used to make risotto, however there are a few other short grain varieties such as carnaroli, vialone, nano, and baldo that you can also use but the most import part here is understanding why one must use short grain rice. In every risotto recipe you will recognize a very important first step, which is to sauté the rice in butter and fragrant shallot, covering each grain with a layer of fat. This step is responsible for the deliciously rich flavor of risotto. Next, you will need to add a small amount of liquid, in this case chicken stock, stirring until the liquid has been absorbed. This will allow the rice to release the starch which will make the risotto super-duper creamy. If you are making a stove top risotto, you will repeat this process until the risotto is done cooking. 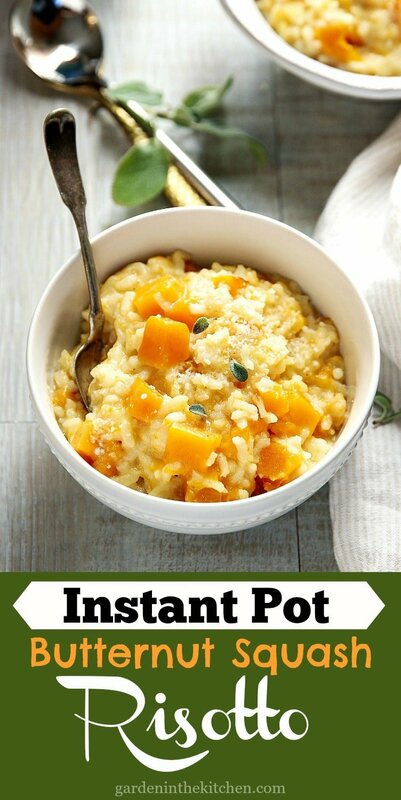 However, with this instant pot risotto recipe, the pressure cooking method will do this job for you. This is the main reason why I only cook risotto in my instant pot, because it cuts down on the amount of work significantly. Once the risotto goes through a brief 5 minutes of cooking under pressure, all you need to do is add in the last very important touch, eggnog and cheese! Although technically you can still achieve a level of creaminess simply by activating the starch, this last step will ensure your risotto is over the top delicious! Now, I must circle back to the eggnog. As I mentioned in the beginning I add a touch of eggnog to my risotto which is literally like putting sprinkles and a red-juicy cherry and on top of the ice-cream. Sooooo much better! 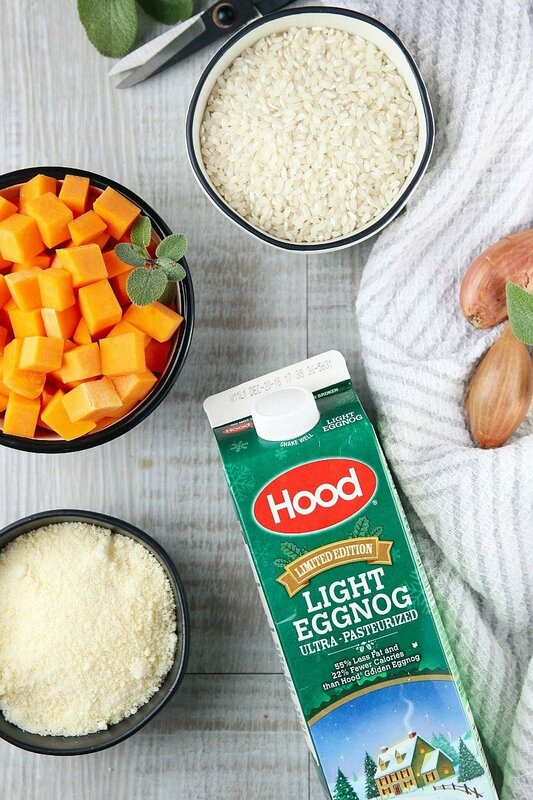 This said, you can freely use Hood Eggnog in your cooking in addition to the traditional way of consuming this creamy yolk-based beverage, as it adds quite a nice touch to your favorite holiday recipes. Hood Eggnog comes in four delicious flavors; golden eggnog, vanilla, pumpkin and light eggnog. They are only available for a limited time, so I strongly recommend that you go to your local grocery store and grab your favorite eggnog flavor (or all of them) and begin enjoying the tastiest eggnog! 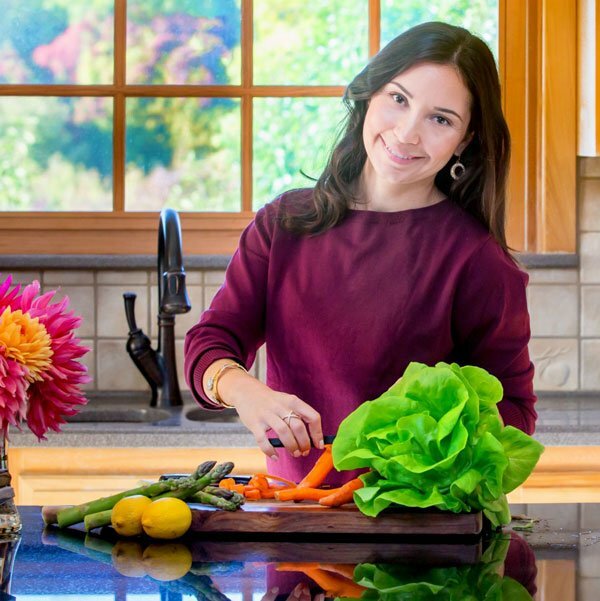 Not only as a delicious drink but also as an ingredient in your favorite holiday recipes! 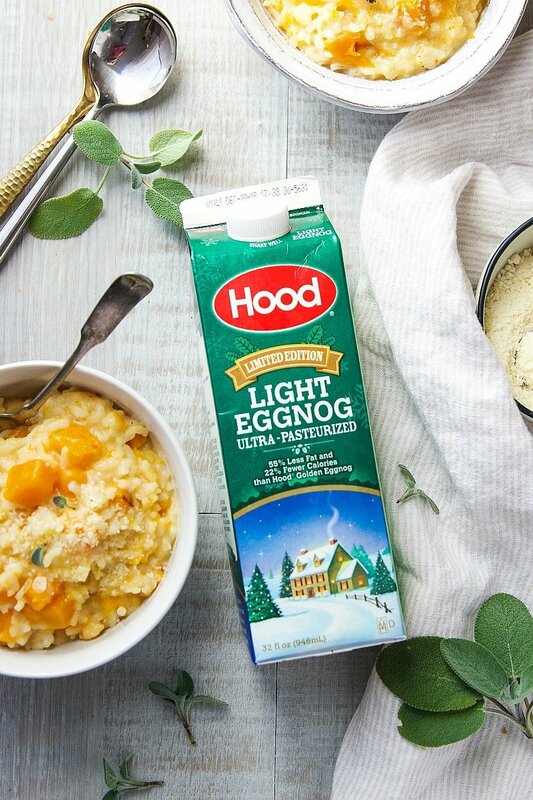 Click here to learn more about Hood Eggnog, get recipe ideas, and find a store near you. 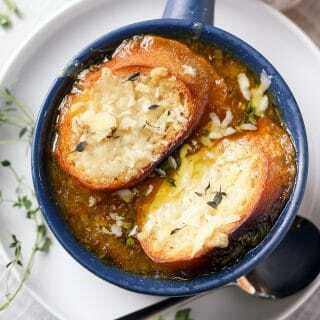 Creamy Buttery Instant Pot Butternut Squash with eggnog, fresh sage and lot’s of parmesan cheese! 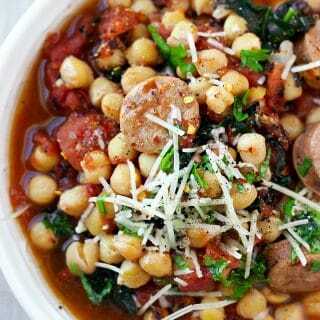 Turn the Instant Pot on sauté mode. Add in butter, when melted add shallots and sauté for 2-3 minutes or until translucent. Add butternut squash cubes, season with sea salt and pepper to taste and sauté for a couple more minutes until the edges start to soften. Add rice and stir to coat. Then pour in 1 cup of the chicken broth. Stir and cook until most of the liquid has evaporated, about 3-4 minutes. Cancel sauté mode. Add remaining broth, stir and close the lid. Turn the venting valve on lock position and cook high pressure for 5 minutes. When done quick release all pressure. Stir in Hood Light Eggnog and parmesan cheese. 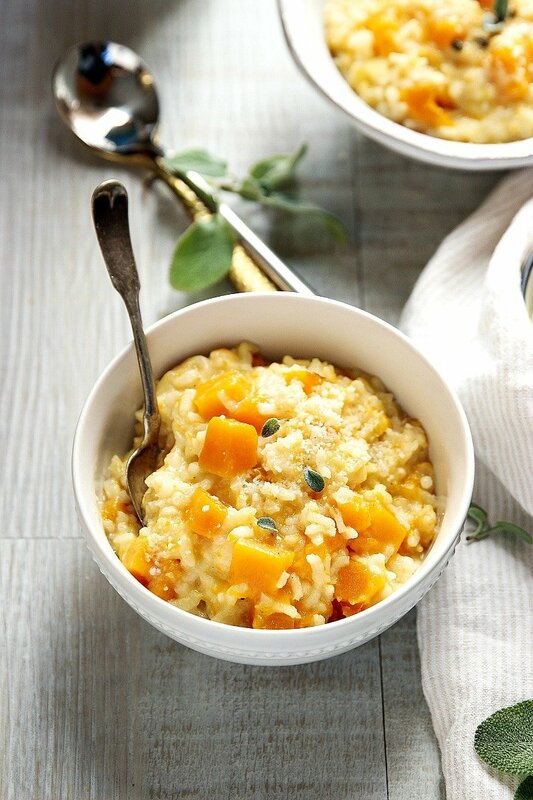 Fold carefully into the risotto to maintain the squash into cubes. 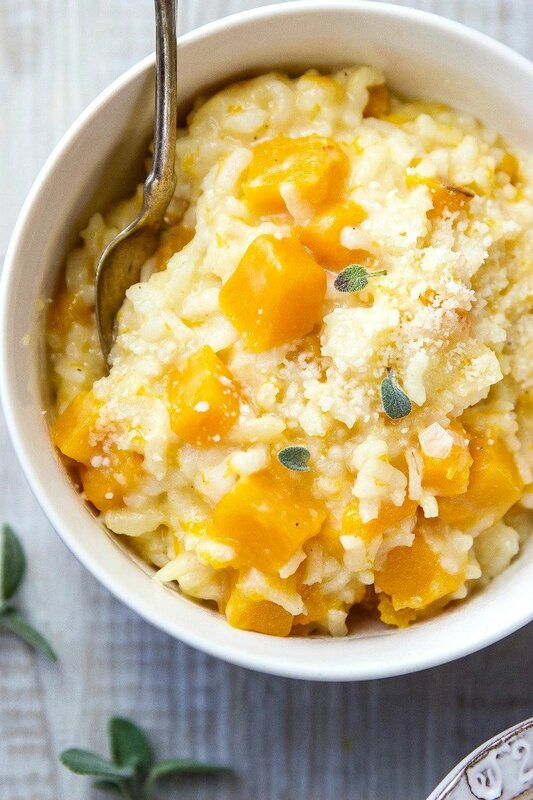 But if you prefer the butternut squash to be more incorporated into the risotto, then you can stir a few times until the squash has broken down. Both options are valid. 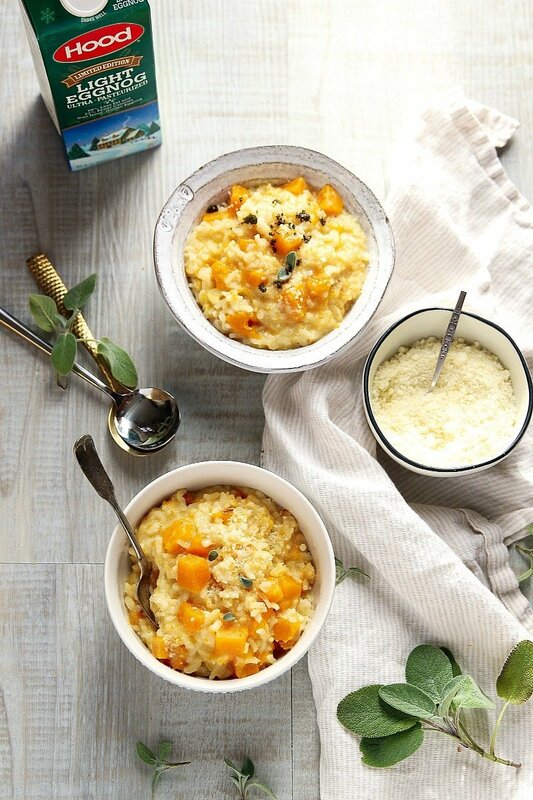 Scoop the risotto into serving bowls, top with fresh sage and parmesan and serve. This post has been sponsored by Hood Eggnog but all opinions stated are my own. Oh how I LOVE risotto!! 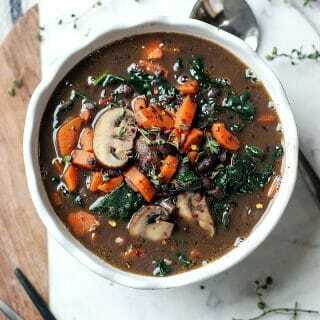 Such a comfort food for winter. 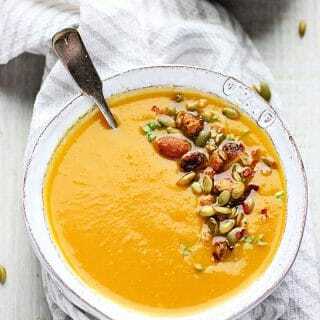 This one looks so darn good with you incorporating butternut squash into the recipe! YUM! I’m pinning for later!